rail and making my own turnouts. In my case, I can have more railroad for less cost overall. setups, ranging from power cars to single locomotives to pairs of locomotives. systems. 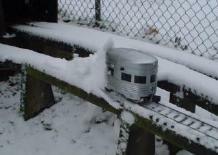 I am very happy with battery power and highly recommend it for garden railroads. No need to clean track. Trains always run smoothly. No need to tighten rail joiners or buy rail clamps. No wiring needed for reverse loops, wyes, and sidings. You can run more than one train on the same track. Saves money on track since you can use aluminum rail and build your own turnouts. Saves money on wheels since you don't need to change over to metal wheels. Cost of remote controls and batteries. Units must be charged before use. Runtime limited when using larger locomotives and long trains. the power switch and the headlight. That's all there is to it! and battery protection circuitry. Excellent for railroad use. seem to last longer than other types and they don't have a "memory" like NiCads. weaker. Last a long time if charged slowly and never completely discharged. higher voltage - like 14 volts for a 12 volt set. button does not cause a sudden jerk; it slows and reverses smoothly, saving motors and gears. charge a 12 volt battery set with 12 to 15 volts, and an 18 volt set with 18 to 22 volts. distribute the weight of the batteries. can fit bigger batteries and receivers. Longer trains look good with more than one engine anyway. gel cells in one unit and a gel cel and big receiver in the other. might not be what others are using today. But they work for me and are easily available. just above the coupler. All Electronics #MJW-8. Battery charging jack: mounted on power car, or on fuel tank of battery-equipped locomotives. Battery charger cable and plug: 2.1 mm co-ax plug. All Electronics #DCSID. speeds. I normally use a 44-tonner or NW-2 with this battery car..
be crude, but it really works! !